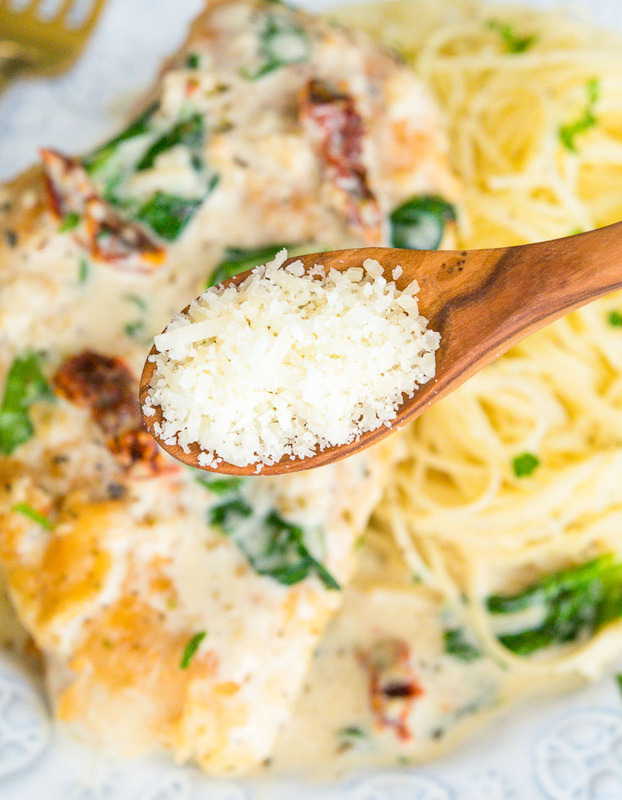 Creamy Tuscan Garlic Chicken smells like Florence and tastes like heaven! Rich and filling, it’s perfect for long days and special occasions! It is not hard to believe that Creamy Tuscan Garlic Chicken comes from the same region as the inimitable Florence Nightingale and Michelangelo’s David. Parmesan breaded chicken, pan-fried in olive oil, and topped with a garlic cream sauce that’s loaded with spinach and sun dried tomatoes? Where do I sign away my life’s savings?? Maybe, a plate of Creamy Tuscan Garlic Chicken will do for now! On the off chance that the smells and tastes conjured up by that list of ingredients isn’t enough to tempt you, may I share that the recipe takes just thirty minutes and only one pan to prepare? Incredibile! Though the prep work is super easy, I like to save this dish for special occasions. Think anniversaries, birthdays, Valentine’s day… Note that the meal is best consumed in one sitting, so prepare just enough for your target audience! When you have recovered from the amazing chicken recipe hangover, you might like to try my Chicken Francaise and Balsamic Chicken recipes! Tuscan chicken is both quick and high quality. I love that it sneaks in spinach and tomatoes! The buttery cream sauce is absolutely heavenly. The smell of sautéing garlic brings the whole neighborhood running! 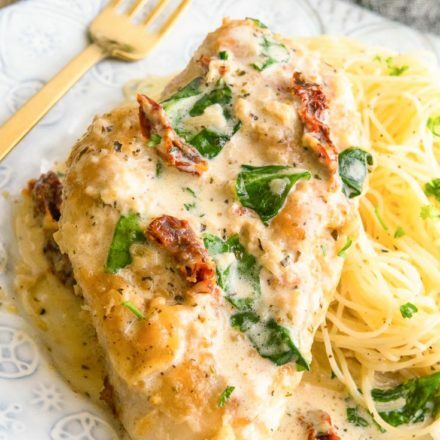 What is Creamy Tuscan Garlic Chicken? 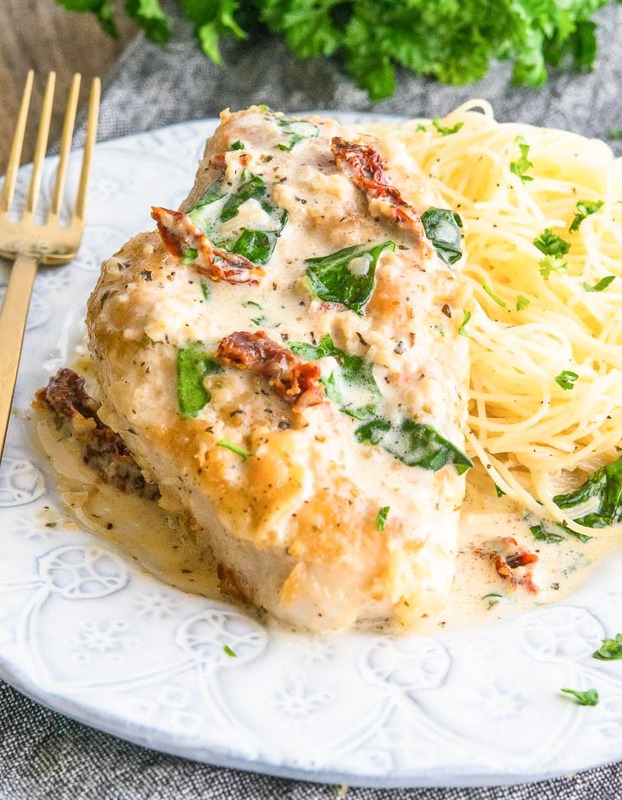 Tuscan garlic chicken is a Buca di Beppo quality Italian chicken dish smothered in a buttery cream sauce. It’s a family favorite, and it is not too tough on the chef either! If you’re a fan, this recipe has some other fabulous Italian relatives: Chicken Lombardy and Chicken Florentine! Buon Appetito! 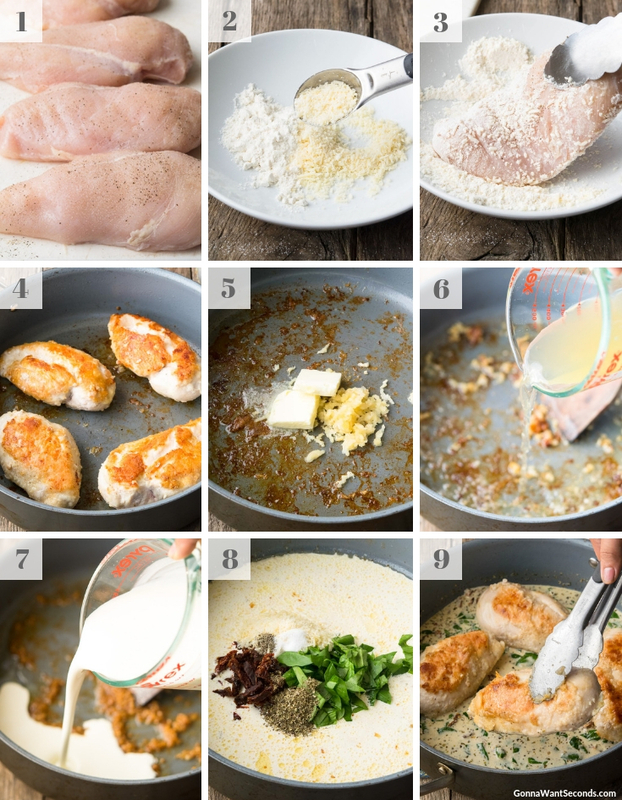 What Ingredients Do You Need To Make Creamy Tuscan Garlic Chicken? The fantastically creamy garlic sauce is made with heavy cream, chopped fresh spinach, sun-dried tomatoes, Italian seasoning (which is typically composed of sage, rosemary, basil, thyme, parsley, oregano, and garlic powder, with some variations), chicken broth, minced garlic, butter, and olive oil. Yum! The boneless chicken breast halves are seasoned with salt and pepper and breaded in a flour and parmesan cheese mixture. If you are looking for another great creamy chicken recipe to save for later, you might also enjoy my Creamy Lemon Skillet Chicken. 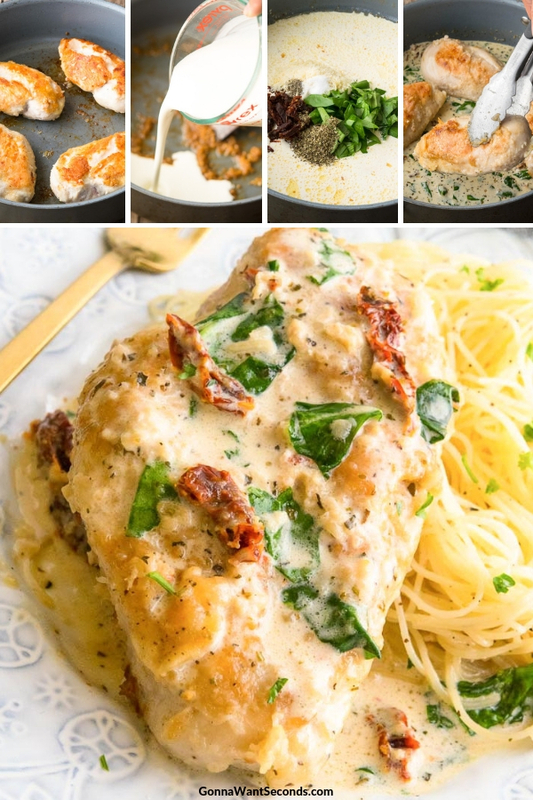 How Do You Make Creamy Tuscan Garlic Chicken? Make this creamy garlic chicken recipe in two basic steps! First, season, bread, and fry the chicken in olive oil. Then you prepare the sauce in the same pan by sautéing the garlic, simmering the chicken broth, and stirring in the cream and veggies along with the seasoning! Thirty minutes with the stove top and you’re done. 1. Dry chicken breasts with paper towels. Season it with salt and pepper. 2. Mix Parmesan cheese and flour in a shallow bowl or plate. 3. Dredge chicken breasts in flour mixture. Shake the excess. 4. Heat olive oil in a skillet. Brown chicken on both sides until well cooked. Remove chicken to a plate and loosely cover with aluminum foil. 5. In the same skillet, saute garlic in butter until fragrant. 6. Add chicken broth to the skillet and bring to a boil. Stir well to loosen the brown bits on the bottom. Reduce the heat and simmer, uncovered, until the broth is reduced to about 1/4 of the cup. 8. Stir in parmesan, sun-dried tomatoes, spinach, salt, pepper, and Italian seasoning. 9. Add chicken back into the sauce and flip it over once to coat. Serve on individual plates then pass the grated Parm. Pat chicken breast dry with paper towels to remove any moisture. Season chicken with salt and pepper. Mix together flour and 2 Tablespoons Parmesan cheese in a shallow bowl or plate. Dredge chicken breasts in flour mixture, shaking off excess. Heat olive oil in a large skillet until it begins to shimmer. Brown the chicken on both sides, over medium heat, and continue to cook until the chicken is cooked through Remove chicken to plate and loosely cover with aluminum foil to keep it warm. Add 2 tablespoons of the remaining butter and the garlic to the same skillet and saute on low heat, until the garlic is fragrant. Add the chicken broth to the skillet and bring to a boil over medium heat, stirring well to loosen all the brown bits on the bottom of the pan. Reduce the heat and simmer uncovered, until the broth is reduced to about 1/4 of a cup. Stir in heavy cream, parmesan, sun-dried tomatoes, spinach, 1/2 teaspoon salt, 1/2 teaspoon black pepper and Italian seasoning. Add chicken back into the sauce and flip it over once to coat. Serve. Cooking the chicken through: The trickiest part of this recipe is probably pan-frying the chicken. It is so easy to end up with either pink or rubberized insides! A good thermometer can be of use here. The thickest part of the breast should reach 165 degrees Fahrenheit. (Remove from heat at 160 for best results, then check to make sure that you’ve got the extra five degrees after letting it sit for a couple minutes.) If you don’t have or don’t like using a thermometer, there are a few other tricks to try. The chicken shouldn’t jiggle when you shake it, and the juice should run clear (instead of pink) when you make a small cut. Another good rule of thumb is five minutes per side when cooking on the stovetop. Parmesan: You don’t need to be too picky about your parmesan selection for this recipe since it is packed with plenty of great flavors. For your information, though, real parmesan must come from the unpasteurized milk of cows grazing on fresh grass and straw. It should have a nutty, fruity taste and a hard, grainy texture. And there are two original Italian varieties! Spinach: If this is an ingredient you use regularly (good for you, if so! ), did you know you can easily cultivate your own? Check out Kids Gardening’s “Grow Your Own Salad” article for family-friendly instructions. 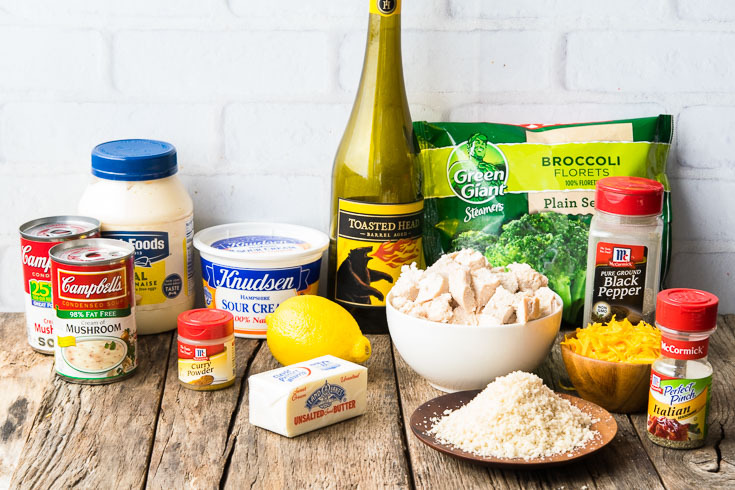 Creamy Tuscan garlic chicken keto: With only two tablespoons of flour, this recipe is pretty keto friendly. Serve with baked artichoke or grilled zucchini. If you are on a super strict keto diet, almond flour and coconut flour are options for breading the chicken, but the taste and texture will be quite different. You could also just skip the breading all together! 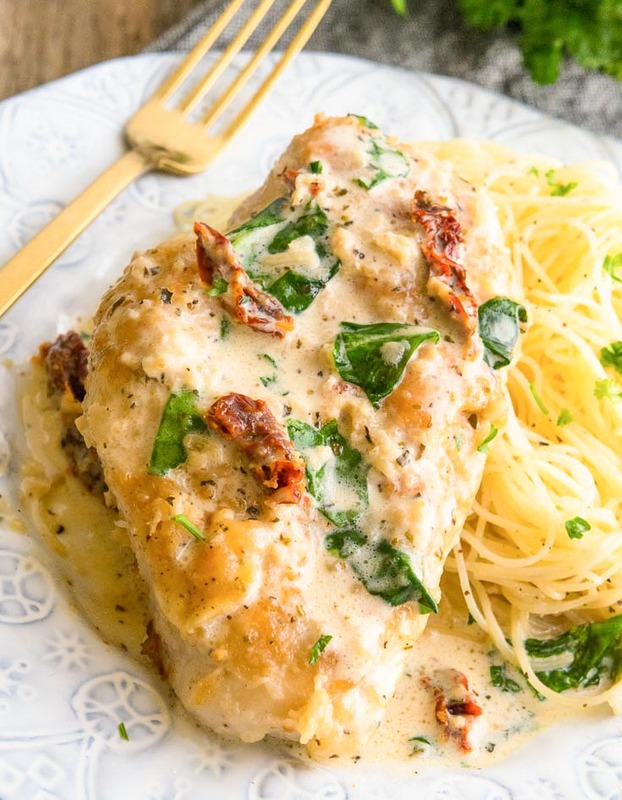 How To Make Creamy Tuscan Garlic Chicken Ahead Of Time: While it tastes best hot off the stove, you can store this dish in the fridge for about two to three days! As always, opt for an airtight container. You can reheat the dish using either the stove or the microwave. Freezing: Garlic Tuscan chicken does not freeze very well. It is easy to overcook the chicken when you reheat it, and you may end up with soggy vegetables and textureless sauce. Creamy garlic chicken pasta is one great self-contained dish idea – I recommend using twists, shells, or tubes to capture some of that fabulous sauce! I also love it with long, flat kinds of pasta like linguine or fettuccine. Some classic Tuscan sides are roasted carrots, roasted asparagus, and Roasted Brussel Sprouts (and let me say, these Brussels are really out of this world!) Its also delicious served with a simple salad tossed with my favorite homemade balsamic vinaigrette.This vinaigrette takes only 5 minutes to whip up. Yay! Tuscan chicken pasta recipes is a restaurant quality dish that my family loves. I’m excited to share it with you very soon! Instant Pot Tuscan Chicken Pasta is another delicious take on this dish and of course, I’ll be sharing it too! This was awesome! I usually tweak recipes but did not and would not change a thing! I want to make it tomorrow and the next day and the next!!….. This sounds like the PERFECT chicken dish! Can’t wait to give it a try!!! Thank you, Lindsey! I hope you like it!